Education - age of nine, he was apprenticed to the atelier of Francisco de Herrera. He later worked under Francisco Pacheco. Cause of Death - Typhoid. His wife was also infected and died eight days after his passing. Husband and wife were buried in one grave in a church that a century later was burned to the ground and never rebuilt. In Spanish art Spanish religion lives. Passion and fanatical asceticism, gloomy, ecstatic sensuality, and hysterical fervor are reproduced in their religious paintings with an unequaled naturalistic power. In a feudal state like Spain, with its grandness and princes of the church, portraiture also found such soil as it had nowhere else. As an artist and a man Velasquez was without equal. John Ruskin (famous art critic, circa 1850s) stated, "Everything that Velasquez does may be regarded as absolutely right." And Sir Joshua Reynolds placed himself on record by saying, "The portrait of Pope Innocent the Tenth by Velasquez, in the Doria Gallery, is the finest portrait in all Rome." Yet until the year Seventeen Hundred Seventy-six, a date Americans can easily remember, the work of Velasquez was scarcely known outside of Spain. In that year Raphael Mengs wrote:" How this painter, greater than Raphael or Titian, truer far than Rubens or Van Dyck, should have been lost to view is more than I can comprehend. I can not find words to describe the splendor of his art!" Velasquez painted religious pictures like the Adoration of the Shepard's and an Adoration of the Kings, a Christ Crucified and a Coronation of the Virgin. He painted landscapes, historical pictures, like the Surrender of Breda and ancient subjects like Los Borrachos and Smithy of Vulcan, Mars and Venus. 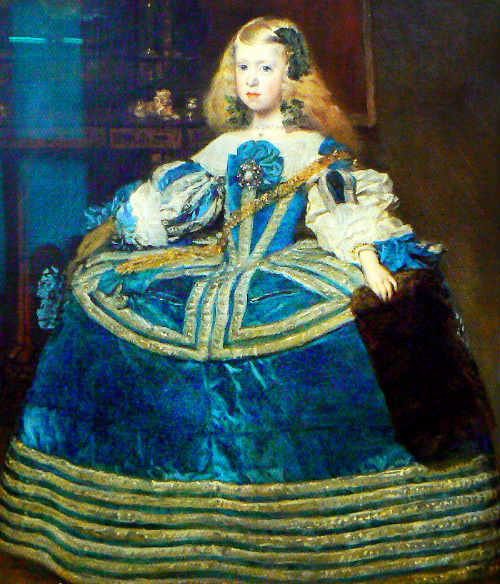 Yet one thinks little of these works when the name of Velasquez is mentioned, but rather his portraits. He is for us the court painter par excellence. The entire enervated Spanish court of the seventeenth century, degenerated from inbreeding, stare down like half-witted fools from his work. No portrait painter of the world had, it would seem, had more interesting problems. Whereas in the works of Titian and Rubens princes alternate with scholars and artists, beautiful women wit generals and statesmen, with Velasquez the same figures always recur with tiresome similarity. Although his activity in Madrid lasted thirty-six years he hardly painted a picture that was not ordered by the king. Two journeys to Italy in 1629 and 1648-51 were the only events that showed him that a world existed outside of the royal palace of Madrid. The same wall which separated the Alcazar from the common herd form the boundaries of his art. Within these walls as little happened. Foreign royalties were infrequent visitors; and of all the court officials almost the only one of whom we hear, except the minister Olivares, was the scheming Cardinal Gaspar Borgia, who returned in 1636 to the Spanish capital, after his fanaticism got him booted out of Rome. At one point he had brought several rats before the Spanish Inquisition and demanded they be burned at the stake for stealing some of his wheat and nibbling at his cheese. King Philip preferred to associate with eccentrics and madmen rather than his courtly ministers. He castle was filled with fun loving dwarves, dancing bears, giants imported from Russia, beautiful young dancing girls, toothless old gypsies and court fools. These are the people whom Velasquez was commissioned to paint. We see in a dozen variations the pale, cold, indifferent countenance of the simple-minded king and his brothers Carlos and Ferdinand: men with pale, languid faces, long Hapsburg chins and protruding underlips, and tired, expressionless faces: men who were old before they were born. We gaze upon Balthazar, the heir apparent, at whose birth his majesty was "so pleased and enchanted that he opened all the doors to the castle and admitted everyone: so that even scrub women and lepers congratulated his majesty. What was the impact of the iconoclast on European art?